My casebook is full of dog owners of every description. Oversentimental owners, owners in need themselves of immediate psychiatric help, owners who never should be owners, owners who have problems but who respond immediately to help given and whose lives are thereby changed for the better. There are owners who wish to imprint their ideas on me rather than letting me imprint my ideas on them, owners who come to me when tired of their dogs and wish me to agree that I think their dogs should be put to sleep, and get downright angry when I say the dog can easily be cured of what is wrong and I attempt to do so at once. One lady drove up in a car and said her dog was impossible, fought every dog it met and would do nothing right, and her husband would only have it put to sleep if I said it was untrainable. This was a bullterrier, a breed known for its aggressive attitude toward other dogs, but in this case there was absolutely nothing wrong with the dog at all. I mixed it with other dogs, freed it with other dogs, made it stay in the "down" position for a prolonged period with other dogs, and found it a highly intelligent, highly obedient and loving animal. I refused to comply with the lady's wish for me to write to her husband and say it was untrainable. This story had a happy ending. She took a course and learned to love the dog instead of finding it a bore, but not many cases have such happy endings. The worst cases under the title of "phobias" are those who project their own faults in character makeup onto their dogs. One lady arrived with a tiny poodle and said the dog had a terrible fear of loud noises, hated water, which the owner said was "eerie," and would not get onto a bus or a car without terror in its heart. The moment the owner stepped out of the car with a subdued husband following in the background I knew where the fault lay. I put a choke chain on the dog and walked it down the road to a site where building was going on and huge brick trucks were tipping their loads with a tremendous noise every few minutes. The dog's tail was up, she was sniffing all the exciting country scents in a typical untroubled doggy manner, and the falling bricks and huffs and puffs of compressors, etc., had not the slightest effect on her. The next thing I did was to put dog and owners into my car and drive to a huge lake near us with "still water," which was supposed to be so "eerie" that the dog would be terrified. I let the dog off the lead and raced around with it, throwing sticks for it to retrieve, and then said, "Patty, go into the water and have a drink," which she promptly did, and paddled quite happily until I called her out and told the owner that as far as Patty was concerned there were no phobias in her life; all were in the lady's imagination and she was trying to project her own phobias about noise and eerie water into the dog's mind. On returning to my home the lady remarked to my husband, who is a doctor, that I had said she was the nut case. I hoped I had shown her who was to blame. I pointed out that with the proper choke chain, a few good jerks should the dog do anything wrong, and possibly a paddle in the lake with the dog by her, there would be no problem with the dog. All the dog needed was healthful open-air walks, a happy outlook on the owner's part and no ideas that the dog suffered any abnormality of temperament. Two days later my choke chain came back in the mail, so I supposed that anything I had done was to be completely disregarded. I had an idea that the root of the trouble in this case was marital, not animal. Recently a man with a golden retriever drove a long; way to see me. He said the dog refused to come out of the car and pulled terribly to get back into it if ejected forcibly. The dog was terrifically fat, which made the handling of it an almost impossible feat, really needing a strong man to achieve the jerks that the dog should have on the choke chain to put sense into it. The retriever had a short lead, a wrong thin-linked choke chain which would have hurt the dog had it been closed on the neck, and the owner's attitude on arriving at my place was "I know you can't cure this." The first thing I did was put my own thick-linked choke chain on the dog and a strong four-foot lead, open the door of the station wagon and call the dog by name, with a commanding voice and a very welcoming voice alternating. The dog just stayed lying down trembling in the car, so I got tough. I said, "Randy, come" and when I gave a very sharp downward jerk on his choke chain the dog bounced out in one leap; then I praised him and let him get back in the car. The shivering started again; I repeated this sequence three times and then took the dog for a walk. As he pulled so terribly on the lead, walks for this dog had, I was told, been impossible. The only freedom he had ever got was when his owners could get him out of the car in some safe place and let him run about, after which he would immediately head back for the car and stay shivering outside. The jerks on the choke chain did the trick. The dog's tail rose from between its legs, he stopped pulling on the lead and when we eventually returned to the car, I opened the back and the dog jumped in and lay down. I gave the command "Randy, come," and the dog leaped out, anticipating another fun walk, which he got. After that there was never any trouble about shivering or not wanting to get out of the car. I suggested the dog be put on a diet immediately to make the effort of going for nice long walk less tiring exercise for Randy and less risk to his heart as he was three years old. The phobias I meet are very often connected with the show ring. Dogs that won't be handled by judges, men or women, and who all would be champions according to their owners if only they would stand still for examination -- not bite the judge, or stay put on a table, or keep their tails up while being looked at, or sit in the ring. This may sound like a tall order to accomplish; yet in fact it all starts with the same routine obedience. One can train dogs up to almost human standards and teach them to reason things out, which many people say is impossible. I have proved with my own dogs many a time that dogs reason if the owners make an effort to develop their brains from the moment the dogs come into the house. I am appalled at the number of dogs whose eyes show little intelligence, whose knowledge of the meaning of words and thoughts is strangely lacking, and whose main idea is either copulation or hunting, the owner being useful only for providing the essentials of life and a home to guard. It is sad how much these owners have missed in companionship and in understanding their dog. But of course to train a dog to a high standard of intelligence as well as obedience takes almost as much time and understanding as teaching a five-year-old child the three R's. Many owners are far too unimaginative in their characters ever to achieve this standard of intelligence in their dogs. They may be too sentimental; they may abandon training too quickly with the idea that their dog doesn't like training. Dogs like training if the owners make it exciting enough. The best owners are outgoing, full of fun, yet gentle and loving as well as firm, and if necessary can appear angry if the dog transgresses. Barbara Woodhouse, "the lady with the dogs," is already familiar to millions of Americans through the publication of her best-selling book, No Bad Dogs, her frequent appearances on such national television shows as "60 Minutes," "The Tonight Show," "Donahue," "Merv Griffin," "Good Morning America," and the syndication of her enormously popular television series, "Training Dogs the Woodhouse Way." There are no bad dogs, Barbara Woodhouse believes -- only inexperienced owners. She ought to know: in thirty years she has personally trained 17,000 dogs and their owners in her weekend courses, teaching perfect obedience to basic commands in only six and a half hours. 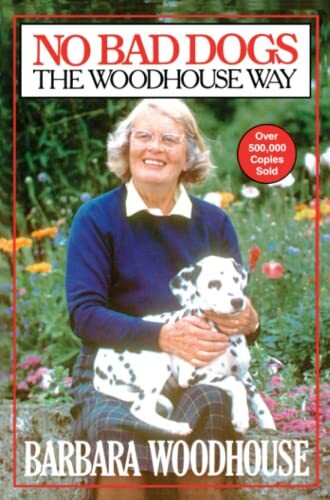 In this irresistible book, Barbara Woodhouse passes on to the reader the simple, effective techniques as well as the infectious, positive attitude that have enabled her to make the most unruly or nervous dog happily obedient -- sometimes within a few minutes, as astonished television audiences can attest. No Bad Dogs will leave every dog owner with both the skills and the indispensable attitude of love, firmness, and enthusiasm that gets results -- The Woodhouse Way.